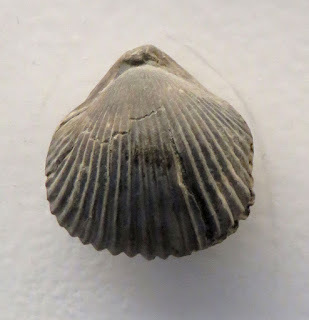 This image of a brachiopod identified as Rhactorhynchia inconstans (J. Sowerby). Other genus names used to describe this specimen are Torquirhynchia and Rhychonella. It was found in the Lower Kimmeridge Clay Weymouth Dorset England. The fossil dates to the Jurassic Period. Fossil was on display at the British Natural History Museum in London, England on August 2016.